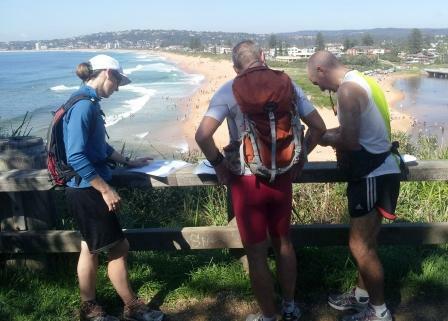 It was another beautiful Sunday morning for our last training run on the trek. Getting up at 4.45am is not really what I am good at and after a short scooter ride with Denis to the train station I was ready to fall asleep again…. After 30 min on the train and bus, we caught up with Jo, Sam and Adam, who was kind enough to drive us 4 from Pymble all the way to Palm Beach for our start. 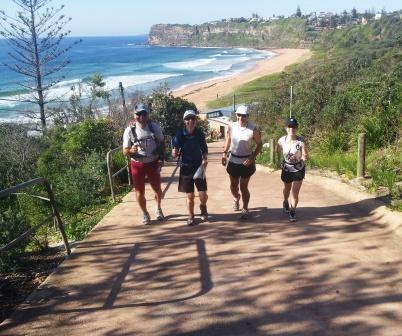 It is February but the morning was cool like in autumn, something which however changed very quickly once we started off and had to climb the first steep hill up from Palm Beach to get to Whale Beach. 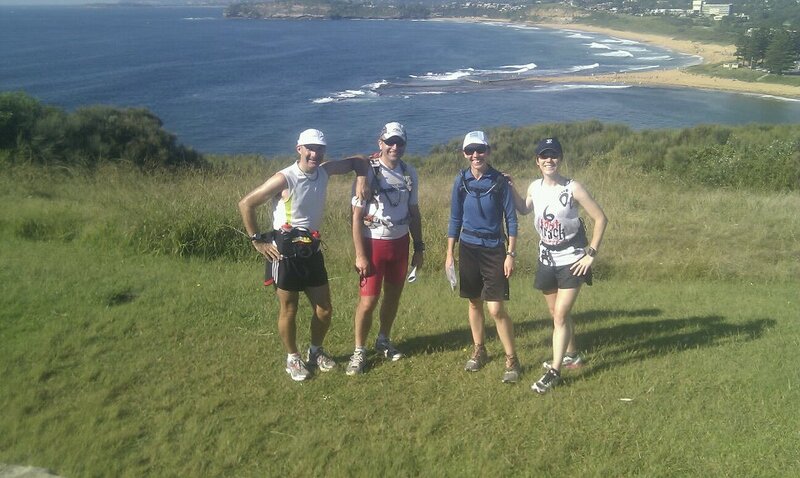 After about 6 km into to run the tail started following the cliffs and the views we enjoyed were spectacular! Glad we had time and cameras with us to take some great shots along the way. Don’t think we will spend too much time during our race taking photos. Some steep ups followed by some steeper downs…. 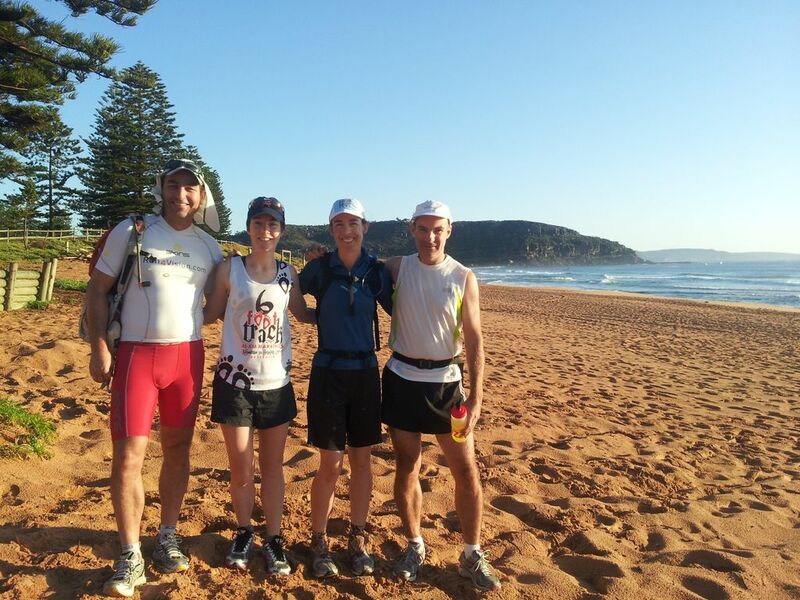 At Avalon we hit our first beach and running in the sand changed our pace quite a lot….have not been running with backpack on the sand since Morocco – some great flashback of hard going across sand dunes and desert. 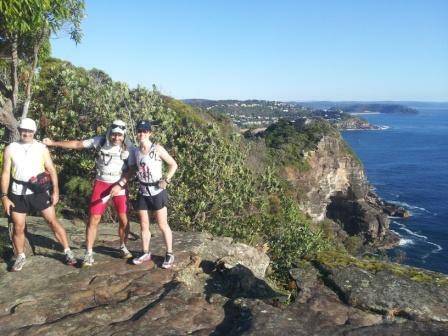 I am not the best with heights but Denis was even more chicken when Jo took this photo of us on the edge of the cliff looking back to Palm Beach and the Entrance of Pittwater. At each beach where we had to cross water I decided to take off my shoes and socks and run the length of the beach barefoot – a quicker way to cover those nasty beaches…. The heat, getting up soo early in the morning and carrying the backpack eventually got to me and I slowed down more then I liked at the end. 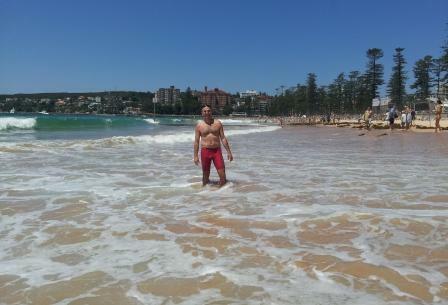 With all the photo stops, getting shoes off and on at each beach and some quick breaks to put our heads under the shower to cool down along the way, we managed to reach Manly in just under 5 hours. I was so happy to get into that refreshing water to cool down and loved the fish and chips lunch even more afterwards. 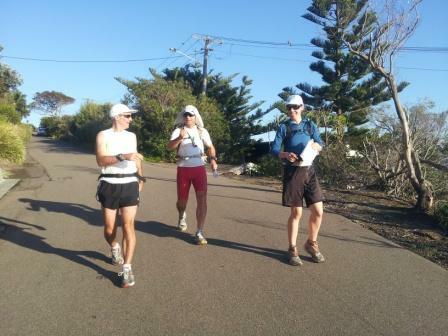 It was a long day from getting out of bed, running 5 hours and getting back to Maroubra just before the thunder storm but a worthwhile exercise as we now know all the little turns and twists of this trail and should no longer get lost on race day…..